Winton "Bones" Marshall was born on July 6, 1919, in Detroit, Michigan. He entered the Aviation Cadet Program of the U.S. Army Air Forces on April 15, 1942, and was commissioned a 2d Lt and awarded his pilot wings at Yuma Army Air Base, Arizona, on April 12, 1943. His first assignment was as a P-39 Airacobra instructor pilot with the 326th Fighter Gunnery Training Group at Las Vegas AAF, Nevada, from April 1943 to February 1945, and then as a P-47 Thunderbolt pilot with the 28th, 32nd, and 23rd Fighter Squadrons of the 36th Fighter Group in Panama from May 1945 to June 1947. His next assignment was as an F-47 and F-84 Thunderjet pilot and Operations Officer with the 48th Fighter Squadron of the 14th Fighter Group at Dow AFB, Maine, from July 1947 to August 1948, followed by Air Tactical School at Tyndall AFB, Florida, from August to October 1948. Capt Marshall served as an F-84 pilot and Operations Officer with the 84th Fighter Squadron at Hamilton AFB, California, from October 1948 to May 1951, and then served as an F-86 Sabre pilot and then as Commander of the 335th Fighter-Interceptor Squadron in Korea from May 1951 to January 1952. During this time, Maj Marshall flew 100 combat missions, and was credited with the destruction of 6.5 enemy aircraft in aerial combat plus 6 more damaged in the air, making him the 5th U.S. Jet Ace of the Korean War. His next assignment was as Commander of the 93rd Fighter-Interceptor Squadron at Kirtland AFB, New Mexico, from January 1952 to July 1953, followed by service as Commander of the 15th Fighter-Interceptor Squadron at Davis-Monthan AFB, Arizona, from July 1953 to July 1954. 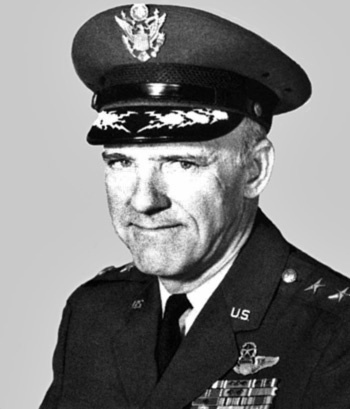 Col Marshall served as Chief of the Central Air Defense Force Tactical Evaluation Board at Richards-Gebaur AFB, Missouri, from July 1954 to February 1958, and then attended Air War College at Maxwell AFB, Alabama, from February 1958 to January 1959. His next assignment was as Deputy Commander for Operations of the 49th Tactical Fighter Wing at Etain AB, France, and then at Spangdahlem AB, West Germany, from June 1959 to January 1961, followed by service as Commander of NATO's Allied Defense Sector in the 86th Air Division at Ramstein AB, West Germany, from January 1961 to June 1964. Gen Marshall served as Deputy Chief of the Air Defense Division and then as Assistant Deputy Director for Forces in the Directorate of Operations with Headquarters U.S. Air Force in the Pentagon from June 1964 to June 1966, and then as Deputy Director of Operations and then Chief of the European Division in the National Military Command Center with the Joint Chiefs of Staff from June 1966 to April 1968. His next assignment was as Chief of Staff for Allied Air Forces Southern Europe in Naples, Italy, from May 1968 to August 1969, followed by service as Director of Plans with U.S. European Command in Vaihingen, West Germany, from September 1969 to September 1971. Gen Marshall served as Vice Commander of 7th Air Force at Tan Son Nhut AB, South Vietnam, from September 1971 to September 1972, during which time he flew 88 combat missions in various fighter and attack aircraft. His next assignment was as Deputy Chief of Staff for Plans and then Deputy Chief of Staff for Plans and Operations with Headquarters Pacific Air Forces at Hickam AFB, Hawaii, from September 1972 to September 1974, followed by service as Vice Commander in Chief of Pacific Air Forces at Hickam AFB from September 1974 to June 1975. Gen Marshall's final assignment was as Deputy Commander in Chief of U.S. Readiness Command at MacDill AFB, Florida, from June 1975 until his retirement from the Air Force on September 1, 1977. Winton Marshall died on September 19, 2015, and was buried at Arlington National Cemetery. For gallantry in action in aerial combat over North Korea on 30 November 1951. While leading a squadron of twelve F-86 aircraft on a combat air patrol, he sighted nine TU-2 enemy bombers headed southward in the area of Namsi-Dong, North Korea, escorted by large numbers of fighter aircraft. Although realizing that the friendly forces were greatly outnumbered and were faced with intense and accurate cannon fire, Colonel Marshall displayed outstanding courage and tactical skill in leading his squadron in an immediate and aggressive attack on the enemy bombers. He coolly and skillfully deployed his forces to obtain the maximum tactical advantage and then led them in on the initial attack, during which he personally destroyed one TU-2 bomber. Expertly regrouping his force, he launched successive and continuing attacks affording the enemy no opportunity to reorganize. On the third pass, his F-86 sustained major damage from two direct hits by enemy cannon fire. One hit was in the leading edge of the left wing, the projectile exploding in the area of the fuel cell. The second projectile exploded against the head rest, destroying the canopy completely and badly damaging his parachute. He received numerous lacerations about the face, head, neck and back. Partially stunned from the force of the second explosion he recovered control of his aircraft but found himself separated from his flight. Although bleeding profusely and suffering from severe shock and exposure to sub-freezing temperatures and despite the sluggish reactions of his damaged aircraft, he rejoined his comrades in battle, against overwhelming odds. Totally disregarding his own safety, Colonel Marshall continued to carry the offensive, and largely through his own inspiring leadership and heroic personal example, the enemy formation was completely disrupted. When he has expended his ammunition and was low on fuel, he was forced to break off the attack and return to home base. Despite his wounds and the adverse flight conditions imposed by loss of his canopy, complicated further by the fact that he was without radio communication or radio compass as a result of battle damage, he managed to land his F-86 safely. At the time of this deed, Colonel Marshall had flown a total of 64 missions in the Korean campaign. The gallantry and selfless devotion to duty displayed by Colonel Marshall in this action of high personal courage reflected great credit upon himself, the Far East Air Forces, and the United States Air Force.